The boats were constructed with two thwarts. These supported the fore and aft ends of the centreboard box and were lodged on the fore and aft stringer. The forward thwart provided support for the mast by way of a hole through which the mast was then stepped on the centreline floorboard. This in turn was secured to the keel using lugs with pegs. The keel box arrangement was constructed immediately to port of the keel (centreline). This left the keel intact with the slot cut through the inboard edge of the garboard plank. The aluminium centre plate was pivoted by way of a bolt through the keel, providing a maximum draught of 2ft 10ins. 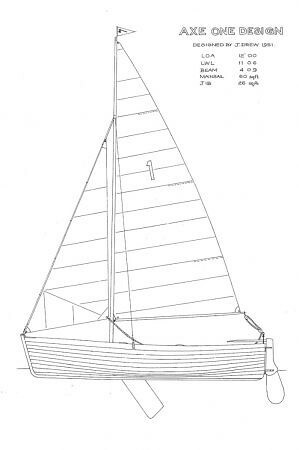 The sail plan was standard Bermudan. The rig was supported by single shrouds and a forestay. The mainsail was sheeted via a rope horse secured to the transom with no cleating arrangement. No kicking strap was fitted to the boom. Various timbers were used in the construction of the boats. The keel was of elm, stem, and inner gunwale were of oak, the transom being either elm or mahogany. The hull comprised of eleven planks from garboard to gunwale. The lower four planks including the garboard, were of elm, the next six planks were mahogany and the top strake was of ash. The ribs were of ash or American Elm. 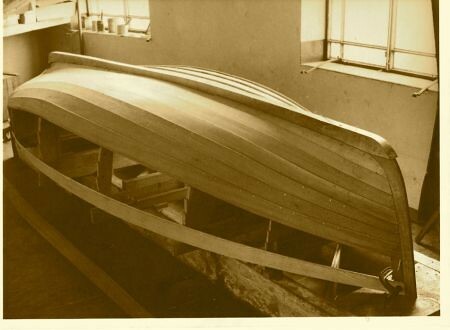 Mahogany was used to construct the thwarts, stern sheets and centreboard box. The rudder stock was made from elm with pivoted mahogany blade; this incorporated five circular lead weights to keep the blade down. The spars were made from silver spruce, being cut at the Yonder Hill sawmill at Yarcombe. Interestingly, the elm for the boats came from the woods behind Stedcombe Manor, (Axmouth) courtesy of Vincent Martin who was the Stedcombe Estate Manager and also A.Y.C . Treasurer. 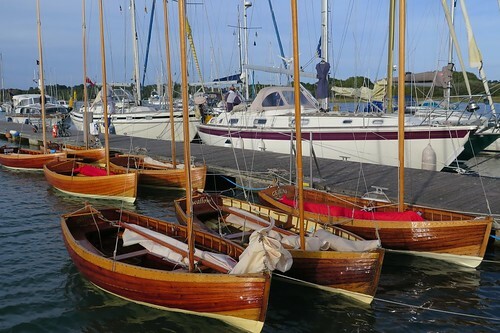 Some of the boats were built from recycled mahogany, the planking having once been a bank counter in Taunton! Both Bernie Webber’s and Gareth Mettam’s had used this timber, which was much darker than the rest of the fleet.